Trudi Thomson was born on 18th January 1959 and first appears in the Scottish Ranking lists in 1992 when she was in her thirties. The following year she had no fewer than six marks registered including two in the number one slot. The distances range from the half marathon to the 24 hours race in Brechin. Prior to that she had not appeared in any fixture list so the question right at the start has to be about how she arrived on the scene. The story as told by one coach is that she worked as a postie (a wee clue to the basic fitness?) but was also a smoker and drinker who one day saw some women running. She thought she was ‘fat’ into the bargain, so she just decided to start running. She ran morning, noon and night and her career led her to race all over Britain, Europe and the world with races at Valladolid, South Africa, Japan and even Pyongyang in North Korea. She last appeared in the rankings list as a Vet45 in 2005 with nine time over four events. She has been described by other runners as “very slim, “very attractive”, “easy to talk to” and was clearly popular with fellow athletes. So – where did it all start? The Ultralegends website tells us that she suffers from rheumatoid arthritis – which may tell us something about why she stopped running – and that she took up jogging at the age of 31 ‘when her 5 ft 4 in frame topped 13 stone’. 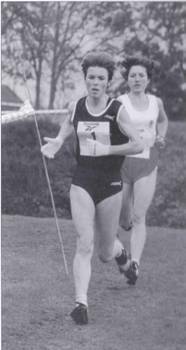 In 1992 Trudi’s single appearance in the ranking lists was with a time of 3:05:43 – nine seconds in front of Leslie Watson – which placed her eighth in Scotland for the event. Maybe more important is that in spite of the rather slow time, it was for winning the Black Isle Marathon. She also won the SWAAA Marathon Championship for the first time in 3:14:30 when it was held in Elgin. This was the furthest north the championship had ever been held: starting and finishing in Elgin’s Cooper Park followed a series of quiet roads past Burghead and Lossiemouth. She raced a lot and was known for being a serious trainer who normally trained twice a day: she is also known as an ultra distance runner and in 1992 she also won the Two Bridges 36 mile classic in 4:48:51 and was to go on and win it in ’93 and ’94 as well. The work was paying off and in 1993 her appearances in the Scottish Rankings were as follows. These were not of course her only races that year but one website indicates that she ran another 100K race in 1993 – at Eltham where she finished second in 8:36:53. Selected for the British team for the World 100K Championships at Torhout, she was a member of the team which won silver medals and, as already indicated, won the Two Bridges for the second time – this time clocking 4:36:37. She was being recognised as a world class ultra runner and an international marathon runner but from here on in, she began to appear in the rankings for shorter races on the track as well as shorter road races. Trudi ran the Lochaber Marathon in April 1994 and ran 2:52:12. Later in the year, on 5th June, a report on the Dunfermline Half Marathon (which incorporated the five nations home countries international) contained the following: “Trudi Thomson of Pitreavie AAC emerged as the star home performer. The 35 year old mother of three girls finished fourth (81:10) ten seconds clear of her nearest Scottish rival, Elaine MacKay of Shettleston. 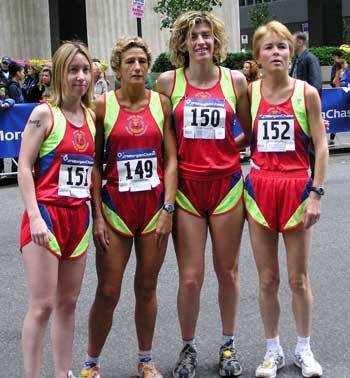 The winner was Lesley Turner of England (79:02). Thomson, who has already won the Scottish veteran cross country and marathon titles this year, thought that she had won a further two titles, her first open national championship, as well as the national veteran crown, and was stunned to be given only the winner’s medal for the latter since the National medals were given controversially to the English runners. She displays an amazing appetite, having finished third in the UK Inter County 20 miles championship at Corby only six days earlier. And only last month she placed fifth in the Two Oceans (Indian to Atlantic) 35 mile race in Cape Town. A fortnight on Sunday she represents Great Britain in the World 100 kilometre championships at Lake Saroma in Japan.” Both early events were maybe significant in her preparations for the big one. She did indeed travel to Japan where she finished second individual in the 100K world championships in the wonderful time of 7:42:17 which is still the Scottish and British record for the distance. Adrian Stott says “ Trudi Thomson of Pitreavie, having established herself as one of Britain’s best, had the race of her life to take the silver medal at the World 100K championships in Saroma, Japan. She recorded 7 hours 42 minutes and 17 seconds which still stands as the current Scottish record and third on the UK all-time list.” She also won her third Two Bridges 36 Miles in a much faster time than before – 4:06:45 which is still the course record for this event which has sadly been discontinued.. The Edinburgh to North Berwick 22.6 miles road race was also won in a course record of 2:15:31. Her top times of the year appear below. It will be noted that not only has she more short fast races in her armoury, she has improved at almost every distance run by a fair margin – ten minutes from the marathon, two and a half from the half marathon, 30 minutes from the 100K . *The actual distance of the 50K race in South Africa was reported to be 56 miles as no split was taken during the race! It only makes the time more remarkable. This mix of relatively short fast races mixed with her marathon and ultramarathon racing was to become a feature of her career. The other feature to be noted here is the determination to travel in search of the appropriate races, no matter how far. Cape Town was in April, Japan in June and Dublin in October. She also officially became a veteran runner and her times are also ranked in the V35 category. A wee diversion: although Trudi is better known as a road runner she is also an excellent country racer and this is perhaps best seen in her superb record as a veteran after 1994 when she was overall winner, regardless of age category, five times in seven years – the record is 1994 – 1st; 1995 – 1st; 1996 – DNR; 1997 – 1st; 1998 – 4th; 1999 – 1st; 2000 – 1st; 2001 – DNR; 2002 – 2nd. She had not run in the National Cross Country often as a Senior – I can only find four runs in the National – but when she did, she ran well: 12th in 1994, 13th in 1995, 5th in 1999 and 4th in 2000. But back to the main story. In 1995 the statistics continued to improve. The road 10K dropped to 34:59 in Coventry, almost a minute and a half from the half marathon to 74:48 at Montbeliard in France and five minutes from the marathon with 2:38:23 in Dublin for a time which was to remain her personal best and place her fourteenth on the Scottish all-time list. Trudi was selected to represent Britain in the World Championship in Gothenburgh where she finished 22nd, three places behind Fatuma Roba who had won the Olympic Marathon in Atlanta. Still improving, still travelling to get the races she needed. Scotland’s Trudi Thomson ran an impressive race in blustery conditions to finish third in Saturday’s 35 Mile Two Oceans Marathon in Cape Town. After lying second for the first half, the Dunfermline mother-of-three caught the early leader, Cape-based Jowaine Parrott, on the two mile climb to Chapman’s Peak (590Ft) but Parrott held the pace on the long downhill and continued in front as they passed the 25 mile point. Again Thomson used the hill and this time passed Parrott. Although she led the field through the 30 mile mark at the top of Constantia in a time of 3:15:43, she was soon overtaken by German Maria Bak, who excelled on the hills. The German had been content to stay in fourth place for the first half, before unleashing a surge that saw her go through 50K in 3:22:56 which opened 27 seconds on Thomson in less than a mile. Bak crossed the line in 3:45:16. Parrott used the final three miles downhill to recapture second place from Thomson and finish runner-up for the third successive time in 3:47:07. The Scot finished 1 minute and 39 seconds later . “I really felt motivated when they played ‘The Flower of Scotland’ at the start and I saw the piper and the flags along the route,” said Thomson,”I was right on schedule for most of the race, but I don’t remember the downhills being so long when I last ran here in 1994. Although I ran well on the uphills my legs were sore and didn’t respond when I tried to stay with Jowaine. I am quite disappointed, I came here looking for a win.” Despite this the record will show that her time would have won every event in 1990 and her times through 30 miles and 50-kilometres are likely to be ratified as Scottish and UK bests. Result: 1. M Bak 3:45:16; 2. J Parrott 3:47:07; 3. T Thomson 3:48:46. Although it was run early in the season – in April – Trudi had already run a marathon in Las Vegas in February where she recorded 2:44:39. Other notable times that year were a personal best for 5000m on the track at Coatbridge where she ran 17:43.4. A 10,000 in 35:00 in July was followed, also in July with 74:34 for the half marathon in Helensburgh and in October 10 miles were covered in Portsmouth in 58:05. The half marathon time was to remain as her personal best. She seemed to like Cape Town because she was back there in 1997 finishing fourth this time in 3:51:02. Otherwise it was a relatively quiet year – winning the Inverness half marathon in 75:18, 35:00 for the 10K at Strathclyde Park a week later, Cape Town in March and then twenty eighth in the London Marathon in April in a time of 2:41:45. There were two trips to Ireland in 1998 – Newry in September for 10 miles in 57:04 and Dublin for the marathon in October where she ran 2:52:19 for fourth place. Two second places in good times were her only other ranking performances that year – 3000 metres on the track at Coatbridge in 10:27.26 and 10K on the road in Perth in 36:12. Becoming a veteran V40 in 1999 seemed to suit her because Trudi appeared in no fewer than eight different lists from 3000 metres to the marathon. Off road she ran in the World Mountain Trial, finished third behind Tracy Brindley and Sheila Armitage and was selected for the Championship which was in Mount Kinabalu Park in Borneo where she was twenty second and second Scott in the team which finished fifth. It was a very good year all round for her, in November she won the V40 British International Championship at at Grenville College, Bideford. Apart from Trudi, only five Scots have won this title, the others being Christine Price, Lynn Harding, Janette Stevenson (an amazing four times! ), Sue Ridley and Jane Waterhouse. The local Press announced that she was first Vet in the Dublin race And again off road she went to the English CAU Inter-Counties representing Scotland East and finished thirteenth to be second Scottish finisher, Angie Mudge being the first. If you look closely at the table below you will see that in her first year as a V40 she set three personal best times – for the road Mile, 5K and 10K on the road – and all at the bottom end of her distance range. In 2000 although there were no personal bests there were many fast times and she raced outwith Scotland on at least seven occasions of her ten best times of the year. Her best 10K was when she won at Grangemouth in February in 34:53 and at ten miles she recorded 56:22 in Ballycotton when placing second. Her four top half marathons were in Valladolid (May: 78:16), Bristol (Oct: 87:19), Glasgow (Aug: 78:29) and Glenrothes (79:00) The Valladolid race was at the World Masters – Non-Stadia – Championships where she won the V40 race. She had four marathons listed too, these were in London (April: 2:40:40), Stockholm (June: 2:45:35), Dublin (Oct: 2:49:37) and Dubai (Jan: 2:50:37). These were all first class times and the distances that she travelled in search of the times were huge. Clearly her appetite for new challenges had not diminished. This is emphasised by her racing the following year (2001) when she started with a trip to The Hague for a half marathon in March finishing tenth in 77:40 – the time placed her second in Scotland. A month later she had a marathon in 2:41:49 in North Korea in which she finished fourteenth. The heavily politicised account of the race put out by the organisers began with the paragraph: “15 April 2001 – Pyongyang – At least 200,000 North Koreans wildly cheered 51 foreign runners allowed to compete in the groundbreaking Pyongyang International Marathon on Sunday, but they could not beat the best from the communist nation.” For the women’s event it read “Chong Yong Ok won the women’s race in a course record of 2 hrs 28 min 36 sec, more than two and a half minutes faster than the previous best. North Korean women took all top ten positions…….. In the women’s race Banuelia Mrashini of Tanzania and Trudi Thomson, a member of Scotland’s Commonwealth Games squad, were the only two foreigners in the top fifteen.” An excellent result in what was essentially hostile territory, have a look at these quotes from the same article. The race was one of the centrepiece events for the birthday of the North’s late founding leader Kim Il Sung. There were 70,000 people in the packed Kim Il-Sung Stadium. And the 500 runners raced past lines of Pyongyang citizens along the streets, playing traditional music and queueing for specially rationed food for the main holiday of the year. Kim Jong On, the winner who won $3000 said, “I have trained every day for this race under the guidance of the Great Leader Kim Il Sung and I am now determined to bring glory to my country at the World Championships in August.” Again the time placed her second in Scotland. A time of 2:50:28 gave her fifth place in Dublin and when the Scottish Marathon Championship returned to Elgin that year, she returned to win it for the second time nine years after her first success in 1992 with a time of 2:49:33. Her support for the national championship is noted at a time when the top women marathon runners were avoiding them like the plague. Other notable times that year included 59:48 for 10 Miles at Portsmouth and 10K in 35:31 in Alexandria. In 2003 Trudi ran three marathons – winning in Belfast in 2:45:48 and in Inverness in 2:50:03, and finishing eighth in Beirut (Lebanon) in 2:50:53. 10K in 35:42 and 10 Miles in 56:11 almost completed her best times – but there was a 3000 metres on the track in the Women’s League in 10:40.36 to show that she had not lost any speed. In 2004, her final year as a V40, she recorded 3:00:31 for the marathon in Mumbai, India, 83:10 for the Half Marathon at Morpeth and 37:00 for the 10K at Halhill. Just as she seemed to have a new lease of life when she moved up an age category at 40, so when she moved into the V45 category in 2005 there were nine entries in the ranking lists. These were all near home, no foreign trips that produced good times and all relatively short distances for an athlete who had performed so well at the very top levels as a marathon and ultra distance runner. Although she continued to run at local level Trudi does not appear in any national rankings thereafter. Her reputation remains such that in an article in 2009 on the Sri Chinmoy website, Adrian Stott says in reply to the question “Can women excel at Ultra-Distances?” – “Certainly, Pitreavie’s Trudi Thomson ran successfully for GB at 100K earning a silver medal at the ’95 World 100K event. Like Ritchie and Pride she trained fairly methodically with good results, also representing GB at the marathon” A little known fact about Trudi’s career is the link with Scottish steeplechase great John Linaker. John advised and coached Trudi for a spell and was largely responsible for her improvement in the marathon and Two Bridges races. An over 50 veteran capable of 2:40 for the marathon himself, he trained with her a lot. We have concentrated here on the principal races of her career but of course Trudi has been a prolific racer at home as well as abroad with her name appearing at events all over the country: the Portobello Promethon, the Round the Castles series, the Polaroid 10K series, the Sandy Slither and Chariots of Fire beach races in Fife and so on. She was never one of the ‘precious’ athletes who restrict their racing at home or who limit themselves to a particular distance or surface – her cross country talents have been mentioned as has her mountain running ability. She always represented Scotland well and we can all be justly proud of what she has done. “Oh, Yes, one other thing,” as Columbo might say,” Trudi is the only woman ever to have run in the Edinburgh to Glasgow Relay!” It was in 1998 and she ran the fourth stage. Unique in Scottish athletics!